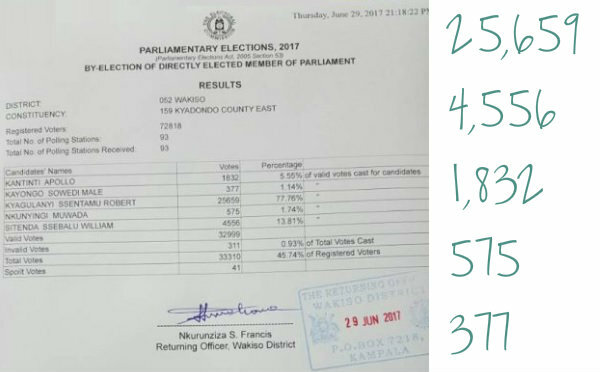 Bobi Wine won in all polling stations ending up with 77.7% of the total votes cast. 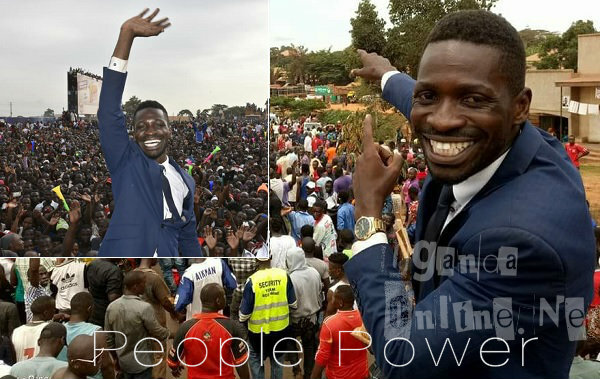 Robert Kyagulanyi Sentamu popularly known as Bobi Wine is the new Member of Parliament for Kyadondo East after garnering 77.7% of the vote. Bobi Wine got 25,659 followed by NRM's Sitenda Sebalu with 4,556 votes. The difference between the first and second is 21,103 votes. The incumbent Apollo Katinti came third with 1,832 votes. The other two contestants, Nkunyingi Muwada and Sowedi Kayongo had a combined total of less than 1,000 votes. Invalid votes were 311 which is 66 votes less than what the last candidate Kayongo got. The former FDC party leader Dr. Kizza Besigye went on to congratulate Bobi Wine the moment the results started to be counted because Bobi Wine was winning in all polling stations by a landslide. 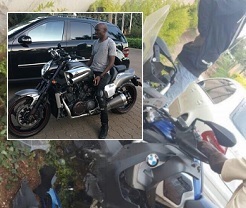 "Congratulations Honorable Kyagulanyi Sentamu Robert..I salute you, sir!!!" 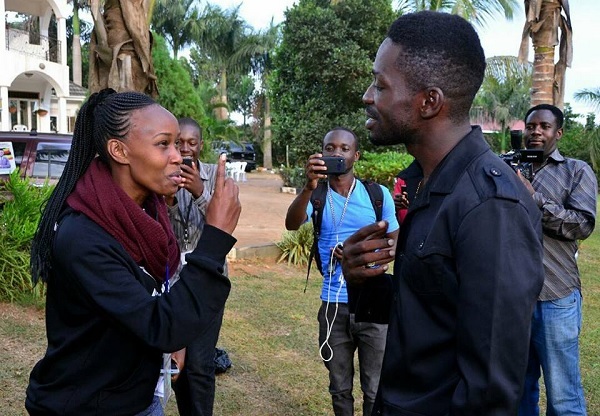 Juliana Kanyomozi noted after Bobi Wine was declared the winner by the Wakiso District Returning Officer, Francis Nkurunziza. The Kyadondo By-Election has highlighted a few aspects, the issue of individual merit VS. party position. On the final day of campaigns in Kyadondo, the party heads were in the area to campaign for their respective candidates, but the end result portrayed a totally different image. President Museveni was in the area to rally support for the NRM candidate and so was the former FDC party President Kizza Besigye whose candidate is the incumbent, but Bobi Wine came and took all the 90 plus polling stations. And then, the number of invalid votes and spoilt votes is something you cannot ignore. 311 votes were invalid and 41 spoilt out of a total number 33,310 of the total votes. THE PEOPLE HAVE SPOKEN-This 29th day of June marks a turning point in the politics of our country! History has been made. The people of Kyadondo East have spoken and their voice is being heard far and wide! The resounding victory is testament that the people of Kyadondo, and indeed the people of Uganda are ready for a new kind of leadership- a leadership which truly represents them. "A leadership of the people, by the people and for the people in its true meaning! A leadership in which the citizen is truly the king and the leaders are true servants! Let the spin masters not try to twist this and come up with all sorts of explanations for our victory- this is nothing but the voice of the people! This victory is evidence that when people are united in purpose there is nothing out of their reach. This victory is not mine. This is your victory!" "My deepest thanks go to all my supporters across Uganda and the world. The people of Kyadondo East, my campaign volunteers- those who spent sleepless nights on the campaign trail, those who made sacrifices to make this happen- THANK YOU. For resisting all forms of intimidation and machinations, and turning up to vote in large numbers- THANK YOU. Most of you kept at the polling stations, and remained vigilant to ensure that no one stole your victory. You have proven once again that people power is more powerful than the people in power!" "To my wife Barbie and our dear children, you know how proud I am of you for being part of this journey from the very first day! Now is the time to get to work. That means that we must put our differences aside and come together to build a great future for our constituency and for our country."